Say, what’s this all about? Bucksta is a non-partisan website dedicated to the promotion of American made goods and services emphasizing quality and a commitment to the environment. It’s offcially summertime! That means it’s time to grab your cut-offs, an inner tube, hop in the Mustang II and head on down to the lake. I’ve already got cold Shastas on ice! Who’s with me? 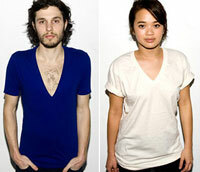 American Apparel has its roots in Canada, oddly enough. Montreal-born Dov Charney started his business career as a child selling collected rainwater to his neighbors. At eleven years old, he was briefly suspended for peddling his own newspaper in front of his school. Why must twins always dress alike? Dov had an affinity for American culture. By the time he was in high school he began smuggling Hanes and Fruit of the Loom t-shirts from the U.S. to sell to his Canadian friends. He felt that the American T-shirt was “iconic and unique and in most ways better than the T-shirts we had access to in Canada.” He claims to have transported as many as 10,000 shirts at a time, renting a U-Haul truck to carry the load. “I developed a kind of importing business, from the United States to Canada,” says Charney. “That’s why it’s called American Apparel.” Charney was later arrested, and that put an end to his “import” business. While attending Tufts University in Massachusetts, Charney continued importing t-shirts. His short-term goal was to begin manufacturing them himself, and in 1990 it was realized. In 1997, as his company grew, he moved the facility to Los Angeles. It's a shame what became of Chris Gaines. There’s a lot to love about American Apparel. They start their factory workers off at $12 an hour, which is $11.60 per hour more than the average garment worker in China. According to Glassdoor.com, American Apparel also starts their Sales Associates off at $1 more per hour than Old Navy. Even if you include the cost of shipping, someone at Old Navy is making a ton of dough, and it’s not the person folding the shirts. It gives new meaning to “The Gap” (Old Navy’s parent company. Terrible joke. I know.). American Apparel is very green. Their “Creative Reuse” program encourages designers to find uses for scrap fabric, such as for children’s clothing, neckties, and scrunchies. As a result, they estimate that they save 30,000 pounds of fabric a week. They also have a bicycle lending program and offer free bus passes to their employees. Plans were made in 2007 to increase their use of organic cotton from 20% to 80% over the next four years (I was unable to find any information on their progress). They also have a 146-kilowatt solar electric system on the roof, providing the factory with 20-30% of its power. As a result of American Apparel’s dedication to social and environmental issues, Goodguide gives them a 6.6, which is great for a clothing manufacturer, and exceptional for one operating domestically. On a personal note, another thing that I deeply respect about American Apparel is that one has to look closely at the garment to see what brand it is. With few exceptions, I will not wear clothing that it also an advertisement. I appreciate that American Apparel knows that if they make an attractive, high quality product, people will make an effort to find out what it is. American Apparel has never shied away from controversy. Their advertisements have drawn both criticism (for being provocative) and praise (for their honesty and lack of airbrushing). The pictures that I have chosen for this post are some of the tamest I could find(Hi, Mom!). Dov Charney has also had a number of sordid charges leveled against him (haven’t we all? No? ), though none has stuck. This isn’t the place to get into the details, but there is plenty written about it online. There is a thin, gray line between lovable rogue and despicable scoundrel. Either way, I know whom I will be dressing up as for Halloween this year. And I know what I’ll be wearing. Previous postUncle Goose. Next postDr. Bronner Soaps. Don’t forget to follow us. Help us out, and start your Amazon searches here. © 2010 Bucksta. All Rights Reserved.